Home » What is Balayage? And is it for you? Chances are by now you have heard this term and probably did a little smile and nod and thought ‘what the heck is that?’ Balayage is a French colouring technique that was developed in the 1970’s. The 70’s! you say, and I am just hearing about this now? Well the truth is, the technique has been around forever, but has had a huge coming up thanks to Pinterest. 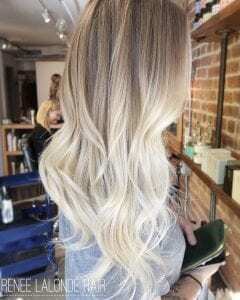 You have most certainly come across many photos of balayage and probably even have some pinned. Simply put it is a freehand hair painting technique that creates a soft gradual lightening effect. Softer than its predecessor Ombre. Balayage as a technique is very versatile and can be use to create many looks. 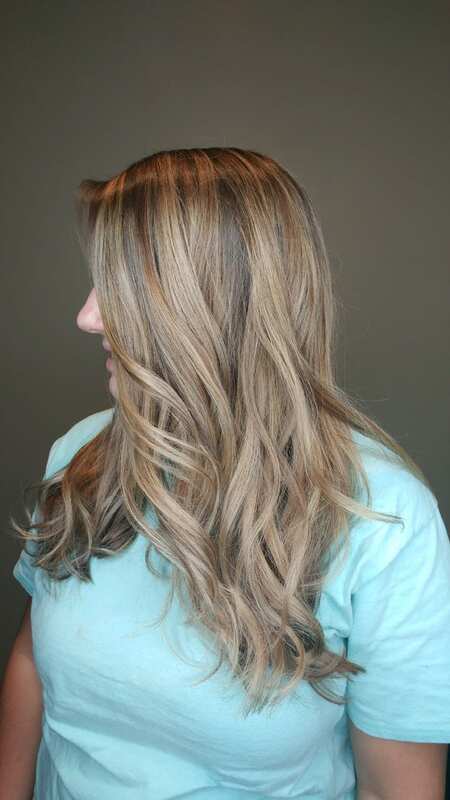 Traditional balayage is performed by painting color onto the hair freehand and processing in open air as opposed to to in foils like most people are used to these days. This creates a beautiful natural look and grows out like a dream. Because it is processed in open air though, it limits the amount of lightness you can achieve. So because of that limitation, it has opened the door for hairstylists to create a myriad of extensions of this technique. A few are foilayage, baby lights and shadow roots. These techniques are used to achieve the lightness that most people are wanting from balayage. By processing balayage in foils, foilayage, it allows it to process faster and lighter thanks to the heat the foil creates. Now that you know a little more about what balayage is, lets talk about whether or not it is right for your hair and what to consider before making your appointment with your stylist. #1. What is the current state of your hair? Is it healthy? Can it handle being lightened? #2. Do you currently have color on your hair? If you have had your hair colored darker (or did it yourself), it is important to understand that previous color will effect the lightening process. It doesn’t mean you can’t do it, it just means you will have to be patient as it might take multiple appointments to achieve your desired result. Be honest with your stylist, for example, if you have used box color within the past year. #3. Is your goal realistic? Yes, we all love these gorgeous pictures , like this, we see all over Pinterest, but reality is your hair might not be able to get there. It is important to factor in also, that those photos could be Photoshopped, have filters added to them or the person could have extensions added to their hair. #4. Which I believe is the most important, is to Find a Stylist who knows what they are doing. My suggestion is to talk to your stylist and see if this is a technique they know how to do. Don’t be afraid to ask for pictures of their work. In this day and age, every stylist should be taking pictures of their work. If you don’t have a stylist or your stylist isn’t comfortable with this technique, get on Instagram and search your local hashtags. For example #stlhair #stlstylist #balayage This will will show you stylists work in your area. Instagram has really opened a whole new world for people to find stylists and view their work. #5. My last tip is to Make a consultation before you make your actual service appointment. This is why… It will allow you to meet the stylist and get a feel for their personality and it will allow the stylist to book the appropriate amount of time for your service going forward. It is stressful for both you and the stylist when there is not enough time booked to achieve the look you want. The stylist should explain what can be achieved during your first appointment and how many sessions it might take to get to where you want to be. A good stylist will also be honest with you about whether or not your expectations are realistic. Lastly and most importantly, you should talk about budget. Make sure that you and your stylist are on the same page when it comes to what you want to spend. Balayage can be pricey up front, but is a lower maintenance color that does not have to be touched up as often as traditional highlights. I hope I have answered some of your questions about Balayage. When it comes down to it, finding an experienced stylist who can answer your questions is key.